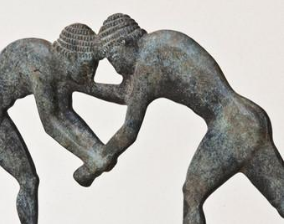 Back in the day there were a lot of sports that you could do the sports you could do is here running, wrestling, boxing, pankration, horse racing and pentathlon. If I was to pick a sport and do it back in the day I would pick wrestling. I would do wrestling because I like to play wrestling with my friends I have a great body to do wrestling. In wrestling to win you need to make them admit defect or quit. If I was to go back in the day and play the sport I wanted to I would play wrestling. I'm not that great when it come's to all the other sports because it doesn't suit me. Welcome to the Winter Learning Journey! Wow, you have made a tremendous start to the programme. I am so impressed to see all of your blog posts and it's only the second day. Wow! You are a star! I really like that you have chosen wrestling for your sport and given it such careful consideration. I agree with you that wrestling would be a lot of fun and would be a great way to get fit, strong and healthy. It is a very difficult sport but I am sure that you could handle it with ease!